Welcome to the LUCIUS Fine Jewelry studio. My name is Christy Lucius, owner of LUCIUS Jewelry. I am a jeweler and metalsmith from Chicago, and I absolutely love creating beautiful works of wearable art. I've been making art ever since I can remember, and it was actually my high school teacher who said she would “bully” me into a career in art if she had to! She had told me that I was one of the most natural artists she had known, and that really inspired me to push forward. I knew it wouldn't be easy earning a living in the arts, but it would certainly be worth it. I went on to college at Ohio Wesleyan University, and got my BFA with a concentration in Metalsmithing. I learned how to solder, hammer, forge, enamel, rivet, cast, carve...the list goes on and on. I absolutely loved it! I was also a painter and did some computer imaging, but I decided I could really build a business with jewelry. I interned in NYC under 3 different designers, and learned even more about technique and running a business. After school, I decided to get a job until I figured things out. I think a lot of people go through this phase of just not knowing what to do once you are out in the real world on your own! I had a couple of jobs that were great, but I always knew it was not what I was meant to be doing. So on October of 2009, I quit my full time job in Columbus, Ohio and headed to the big city in pursuit of my dream. It's scary when you finally make that decision to leave it all behind for the unknown world of entrepreneurship, but it's the best decision I've ever made. Moving to Chicago pushed me forward, and in March of 2010, LUCIUS Fine Jewelry was born. I began doing art fairs and fashion shows in the Chicago area, and I am so happy with all of the opportunities the city provides. My work has been well received in the city, and is available in numerous specialty boutiques. I set out to create jewelry that is unique, yet easy to wear. So often, many creative and unique pieces are impractical or uncomfortable. Yet with so much of the same old jewelry out there, it is easy to see why people are looking for something different. LUCIUS Jewelry manages to be comfortable, but still stand out. 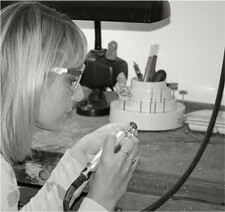 The organic, sculptural quality of my jewelry has to do with the fact that each piece is handcrafted personally by me. It is very important to me that the piece retains that handmade quality. It is what gives my jewelry character. My works are inspired by the things I love, including travel, fashion, mythology, and different cultures. I would also say the Art Nouveau movement inspires my work, I love curvilinear and organic shapes and I believe that translates into my jewelry. In the end, I think we all need to do what makes us happy. Even though it is hard work at times, I actually enjoy the work because I am doing what I love! I hope you enjoy looking at my art and that you find something you can treasure for years to come.